Unlike quantitative research which aims to quantify or count the number of opinions, the aim of qualitative research is to explore the range of opinion and diversity of views, and collect “rich information”. The number of participants required therefore depends on the nature of the research and how many are needed to answer the research questions. The focus generally is not on sample size but rather on sample adequacy because generalisability is not what you are aiming for. Hence, the adequacy of sampling is usually justified by the reaching of “saturation” (Bowen, 2008) and is used by researchers as an indication of quality (Guest, 2006). Bowen (2008) argues that researchers are not being transparent about exactly how saturation is reached, and highlights there are also practical constraints in terms of time and resources on how many participants can be interviewed, and sometimes saturation cannot be reached. O’Reilly and Parker (2012) explain that this does not invalidate the findings; rather it means that the phenomenon has not yet been fully explored, and this should be reported with the findings. Thematic/data saturation usually means that data should be collected until there are fewer surprises in the data and no more patterns or themes are emerging from the data (O’Reilly and Parker, 2012). 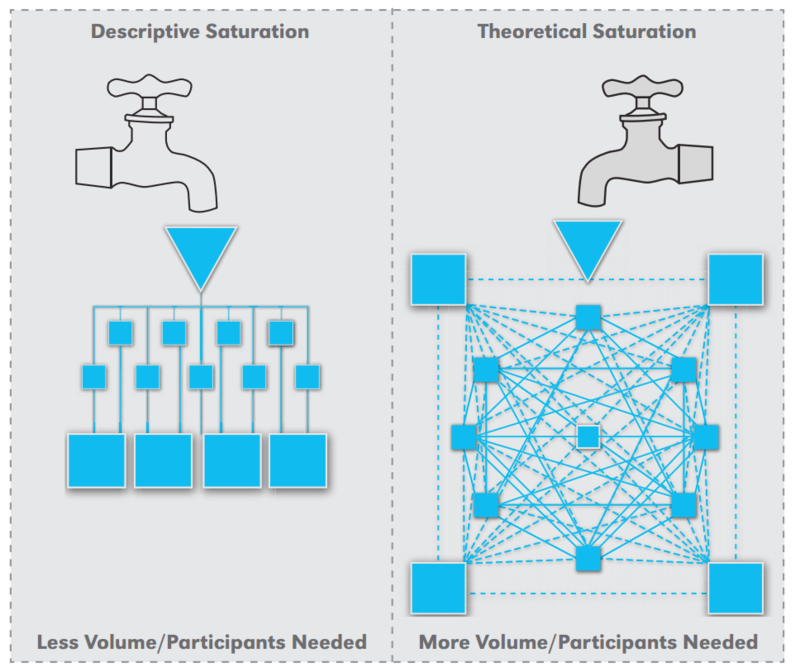 Theoretical saturation is mainly used in grounded theory, and here saturation does not mean the point at which no new ideas emerge, but it means that categories are fully accounted for, the differences between them are explained and the relationships between them are tested and validated, which results in a theory emerging (O’Reilly and Parker, 2012). Is it possible to ever reach “saturation”? Saturation does have a practical weakness, in that there is always new data to be discovered and data can never be truly saturated (Wray, Markovic and Manderson, 2007). Studies in particular which use a deductive approach where the research is not guided by types of revelations or ‘categories’, some argue that imposing data saturation as a quality indicator is not always relevant (O’Reilly and Parker, 2012). Bowen, G. a., 2008. Naturalistic inquiry and the saturation concept: a research note. Qualitative Research, 8(1), pp.137–152. Guest, G., 2006. How Many Interviews Are Enough? : An Experiment with Data Saturation and Variability. Field Methods, 18(1), pp.59–82. O’Reilly, M. and Parker, N., 2012. ‘Unsatisfactory Saturation’: a critical exploration of the notion of saturated sample sizes in qualitative research. Qualitative Research, [online] 13(2), pp.190–197. Available at: <http://qrj.sagepub.com/cgi/doi/10.1177/1468794112446106> [Accessed 21 Jul. 2014]. Wray, N., Markovic, M. and Manderson, L., 2007. ‘Researcher saturation’: the impact of data triangulation and intensive-research practices on the researcher and qualitative research process. Qualitative health research, 17(10), pp.1392–1402.